Chennai, March 21 - Officials of the Central Bureau of Investigation (CBI) are carrying out a search at the residence of M. K. Stalin, son of DMK chief M. K. Karunanidhi, Thursday. Curiously, the search comes two days after the DMK announced its decision to pull out of the central government and the Congress-led United Progressive Alliance (UPA), dissatisfied with the centre's stand on the Sri Lankan Tamils issue. Tamil Nadu Deputy Chief Minister M. K. Stalin on Sunday announces an invitation, calling all the electronic industries to set up their factories in the state along with their supplementary units. He said that automobile industries is growing at a faster rate in Tamil Nadu, holding around 85% of the domestic market and our government also expects a similar growth in electronic components so he requests all the electronic product manufacturers to invest in Tamil Nadu. Chennai, Jan 11 : Tamil Nadu Deputy Chief Minister M. K. Stalin Monday told the state assembly that work on the Hogenakkal drinking water project would start in March and be completed by 2012. Replying to the issues raised during the debate on the motion of thanks to Governor Surjit Singh Barnala for his address to the house, Stalin said: "Work on the Hogenakkal integrated drinking water scheme will start this March and will be completed by December 2012. The work will be carried out in five phases." The proposed Financial City near Chennai, a brain child of State deputy CM, M K Stalin, is expected to come in 180 acres of land at suburban Sholinganallur and Perumbakkam. The Government aims to attract investors, especially from insurance, finance and banking sector for levering growth to the city after successful automobile, IT and healthcare sectors, which managed to bag whooping investments during the last few years. Tamil Nadu Deputy Chief Minister M K Stalin has added another feather to his cap. Stalin said that he would donate his organs to those in need. He made this announcement at the launch of MODE (Miot Organ Drive) at MIOT Hospital at Manapakkam near Chennai on Friday. He said that he wanted to create awareness among people on organ donation and its importance. The minister further added that there was a vital requirement for organ donation as many lives could be saved by transplantation of the vital organs. The Tamil Nadu government is eying global industry players to invest in the state, in an attempt to mitigate the impact of global slowdown. It has come up with 'country specific' industrial parks, in a bid to attract investment to boost up the slowing economy of the state. TN Deputy Chief Minister, Mr M K Stalin, while presenting a policy note of industries in the state assembly, said that the government has identified some companies from various countries, having potential to invest in the state. Tamil Nadu Deputy Chief Minister M. K. Stalin said that his government would take all possible steps to support industry, introducing a bill for single-window clearance of industrial projects in the coming assembly session. The Deputy CM, after a meeting with industry and commerce leaders, assured adequate power supply and conductive atmosphere for the industry of the state. 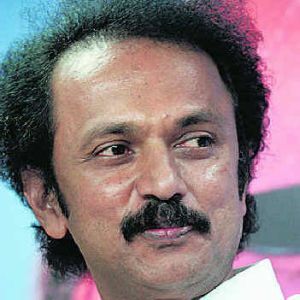 The Election Commission has filed a criminal case against Tamil Nadu Chief Minister Karunanidhi's son M K Stalin after Stalin was shown on the television giving money to the voters during campaigning. The Election Commission has also given a notice to Jayalalitha's party for the similar action of bribing the voters. The DMK said that giving money to parents after roadside christening ceremonies is a common practice. To testify its complaint, the opposition AIADMK, televised it as an illegal means being adopted by the ruling DMK to woo voters in Thirumangalam.